DENVER, March 19, 2018 /PRNewswire/ -- DaVita Kidney Care, a division of DaVita Inc. (NYSE: DVA) and a leading provider of kidney care services in the United States, today celebrates Robert Provenzano, M.D., FACP, FASN, chief medical officer for Nephrology Practice Solutions and vice president of medical affairs for DaVita Kidney Care, for receiving the Distinguished Nephrology Service Award from the Renal Physicians Association (RPA) at its annual meeting last week in Orlando, Florida. "It's a privilege to be recognized by my peers with this honor," said Dr. Provenzano. "I'm grateful to have worked alongside many of you throughout my career as we've strived to care for patients with kidney disease and help them lead better quality lives." The Distinguished Nephrology Service Award recognizes an RPA member who has contributed to nephrology in the field of socioeconomics or clinical practice, and who has largely impacted the clinical care of kidney patients. The recipient is nominated by fellow members, and nominations are based on a member's demonstration of local and/or national leadership that is aligned with the RPA's mission and goals. 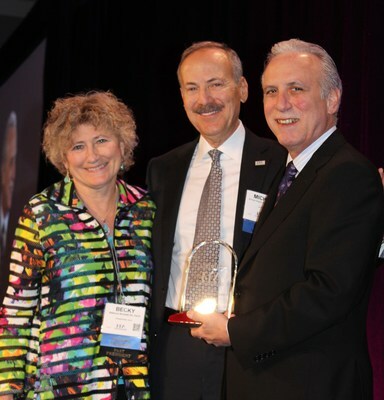 "This is a well-deserved celebration of Dr. Provenzano and his professional accomplishments," said Allen R. Nissenson, M.D., FACP, chief medical officer for DaVita Kidney Care, past president of RPA and previous recipient of the Distinguished Nephrology Services Award. "We're incredibly proud of him and the work he has done to benefit patients both at DaVita and within the larger kidney care community." Dr. Provenzano has been a member of the RPA for more than 25 years and has served in multiple leadership positions, including president and councilor. Dr. Provenzano joined DaVita as vice president of medical affairs in 2004. In 2014, he became the chief medical officer of Nephrology Practice Solutions, a national kidney care management company affiliated with DaVita, overseeing owned and managed practices. In addition, he's a clinical professor of medicine at Wayne State University School of Medicine in Detroit and has published extensively on kidney care business models. To learn more about Dr. Provenzano and other physicians who work in the Office of the Chief Medical Officer at DaVita, please visit DaVita.com/Physicians.